This bronze gear is used by an OEM supplier of Automotive suspension control systems and drives. 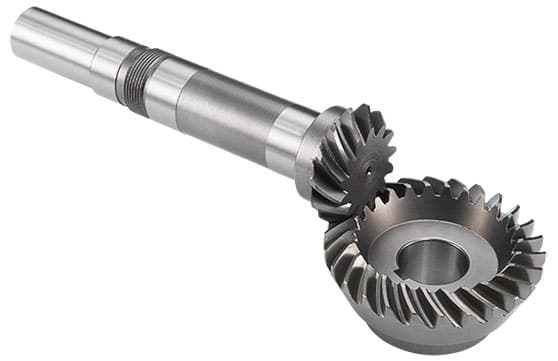 The 17 mm, miniature worm gear went through eight steps from raw material to delivery. First, the C3604 Bronze material was analyzed to meet the project requirements. Next, the raw bronze material was transferred to the CNC machining division. Here the raw material began to take shape with precision machining, by maintaining the tight tolerances requirements. After CNC machining, the worm gear received Magnetic grinding. This specialty grinding is performed by using stainless steel media, water, deburring solution and the worm gears placed in a container. This container is moved at a very high speed through the use of magnets. This movement creates a brushing motion that results in the removal of burrs and sharp edges from the worm gears. Magnetic grinding is ideal for this gear due to it’s smaller size, material and the ability to deburr, polish and clean simultaneously. Once machining and Ultrasonic cleaning steps were completed, the gears received a final quality inspection, sorting and secured packaging for Sea transport shipment. The annual production of this gear is 150,000 pieces.